Springtime Ramp Search. Better than Easter Eggs! Ramp? Like the thing you skateboard off of? No. Not that ramp. 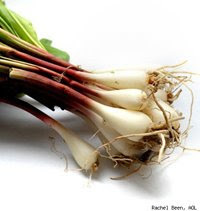 I googled "RAMPS, food" and found a whole world of message boards and blog posts about where, when and how to find and serve "RAMPS". The NY Times even did a "Hunting for Ramps" article a few years back. Spring Ramp Search. Apparently there is a kind of cult following of people who go out foraging for ramps when they are in season from late March to early May. Instead of Easter eggs, foodies go ramp-hunting in spring! "Ramps are very potent onions, in fact most ramp hunters sniff them out in the woods." "I love ramps. Basically a stronger flavor wild leek/onion. I know they grow in Indiana and Kentucky & sprout right b4 morels." "I had some pickled ramps in a wonderful tasting menu at Babbo. They are similar to scallions, right?" What: In the leek family. Looks like a cross between a scallion and a leek. Floppy bright green tops, white bulb bottom. Nutrition, (my specialty): High in Vitamin C! Good source of fiber, and low in calories. "Ramps are transformative, even magical. Once, as I was carting pounds of them back to the city, their intense garlic smell turned floral, almost like the scent of lilacs." ...I'm by all means not an expert on ramps-yet! Please leave comments about your RAMPS knowledge. And if I find some ramps-I will post a recipe and taste-review for sure!